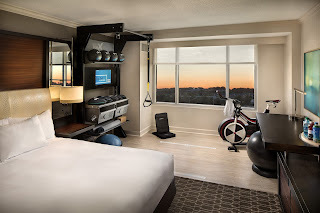 LCWA recently helped client Ecore promote its selection as the exclusive provider of state-of-the-art ergonomic flooring for Hilton Hotels’ new revolutionary “Five Feet to Fitness” suites, a new wellness concept that brings more than 11 different fitness equipment and accessory options into the hotel room. with the amenities of a fitness center in the privacy of their own rooms – making it more convenient than ever to maintain health routines when traveling. Each of the Hilton fitness rooms feature a workout section covered in Ecore’s Forest rx flooring, a highly versatile surfacing solution designed to provide good ergonomics, comfort, acoustic benefits, and superior performance characteristics. The Forest rx flooring provides cushioning to absorb impact on athletes’ joints, increases sound control so as not to disturb neighboring guests during workouts, and offers anti-fatigue capabilities for a variety of workouts ranging from high-intensity interval training and plyometric exercises to yoga and meditation. Our outreach to industry trade media to announce the partnership with Hilton has generated extensive coverage including nearly 15 placements to date in prominent athletics, hospitality and flooring publications such as Athletic Business, Building Design & Construction, Floor Covering Weekly, Floor Trends, Hotel Business and Hotel Management. And, several other publications are planning future coverage. We look forward to generating more great coverage for this innovative product installation and trendy new fitness concept.